The newsletter gives you recent and forthcoming news about activities in the local history community. 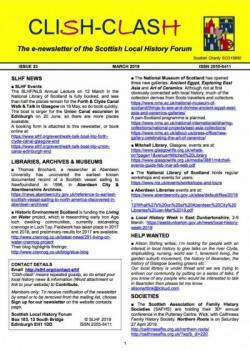 “Clish-clash” means “repeated gossip” in Scots, and the newsletter passes on information about local history activities. We aim to issue Clish-Clash bi-monthly, but this depends on the amount of information we receive from members and others. Are any local history events planned in your area? Send us your talks programme. Is your library, museum, or archive opening an exhibition, altering a reading room, organising an event? 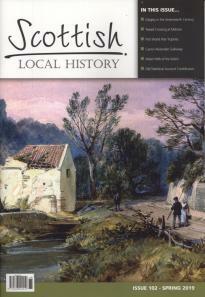 Has your organisation published something relating to local history, or have you found something of interest? Announcements of recent publications will be in Clish-Clash. 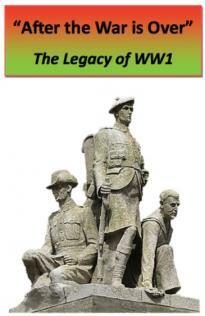 Please note that book reviews and news will still be published in Scottish Local History. You can download copies of Clish-Clash from this page, or Members can be emailed a copy automatically on publication. To be added to, or removed from, the email mailing list, go to Contact and choose category Sign up for our Newsletter. To submit news and information go to Contact and choose category Contribute. 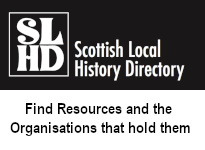 Information about your events can be submitted online and may be listed in Clish-Clash, the journal Scottish Local History as well as on our website.